As the copywriter for heavy-hitting creative industry entrepreneurs like Jenna Kutcher, Katelyn James and Hilary Rushford, Ashlyn Carter knows a thing or two about effective branding and copywriting. She left her job as a publicist, working with clients like Delta Air Lines and Chick-fil-A, to go full-time with her own business Ashlyn Writes. Now the entrepreneur and HoneyBook educator helps others reach their business goals by crafting their messaging and sales copy. We knew Ashlyn would be the perfect person to teach the branding portion of our Business Fundamentals for Creative Entrepreneurs video series premiering on June 14. Here, she shares why she started her business, who should watch her class and why “niche down” is her personal mantra. RSVP for her class here (click “Get the Free Class” in the top right): Branding Strategies to Ignite Your Marketing. Every business starts with a problem. Mine was that I believe getting the good messages out in a noisy world shouldn’t be so hard. I was working as a publicist in corporate marketing moonlighting as a wedding calligrapher after hours, when—long story short—I went into partial hospitalization for generalized anxiety, depression, and an eating disorder at 27. I threw a peace sign up at the corporate offices door and started taking on calligraphy and editorial writing gigs. I was amazed how other creative small businesses didn’t want to write marketing words. Wait, how were they going to make money if they couldn’t sell? If they only ever hustled? I started my business because I believe there’s an alternative. I believe you can work from a place of rest, not hustle. By teaching creatives how to sell with their words, they’re able to pull one of the strongest levers there is in marketing … and in turn, able to get a little more whitespace back. I believe getting the good messages out in a noisy world shouldn’t be so hard. Tell us about your Branding Strategies to Ignite Your Marketing class. What’s it about? Who should watch it? A lot of people come to my team to have us help them craft copy for their website, and are SO excited to hear that someone out there exists that can take messaging and writing off their plate. 🙂 I totally get that, but here’s the thing: by outsourcing messaging, some business owners are inadvertently outsourcing the psychology of sales for their business. That’s something you have to understand. That’s a marketing component you need to be able to understand on your own. People should watch this class if they’ve ever worried about how to stand out in a saturated market. If they’ve ever thought that their “branding” is just logos and imagery. If the thought of talking to clients in a sales-type conversation makes them start sweating. Honestly, the whole thing was a dream. I used to sit at my corporate desk with earbuds in, sneaking CreativeLive classes as background noise while I was filing press clips or drafting a PR report. I had no idea what kind of business I wanted to start, but I was able to afford learning and explore career options on CreativeLive’s website. Now, it’s my name teaching one of the classes I used to binge-watch. Seeing that come full-circle is crazy! You share tons of advice and lessons-learned in your class. What’s one of the most important? In your class, you talk about the value of having a Copy Bank. What is that and how can it help entrepreneurs craft their voice on social media and in their marketing? In a nutshell, you need a brand messaging style guide. I call it a Copy Bank—I have a whole Copy Bank Kit shop item where I go into it, and teach students in my course how to do it, too. When I worked for big brands—the Delta Air Lines and Chick-fil-A’s of the world—you always have a doc that everyone can use to zero in on what the message and voice of a brand is. Even when you’re a solopreneur, start making one. It helps you stay true to your brand voice when writing for your website, blogs and captions and fuels copywriting creativity by providing an endless vault of wordsmith ideas. What’s a common misconception about copywriting that you want to set the record straight on? That copywriting is fluffy words. Cut to the point! The words only have ONE job—to get someone to take the action you want them to take. Otherwise, delete. Even some of our “big name” clients learn this from working with us, which shows me this is something we need to keep educating on. There shouldn’t be words in your emails or on your website that aren’t serving a purpose. I’m a stats lover … go figure. I’m a conversion copywriter, and that’s what I like about copy. It’s not meant to be placeholder fluff. It’s meant to elicit action. My favorite projects are the ones we can really measure … I REALLY like seeing numbers after a launch, and getting to hear the income we helped drive and what lift on a project’s numbers we got. What’s a favorite branding project you’ve recently worked on? I love any time we get to shift voices—we did some recent work for Melyssa Griffin, who has a really different voice from, say, Beth Kirby of Local Milk, whom we were also working with at the same time. So that’s fun for me—it’s like getting to play dress up on Halloween. I love any time we get to shift voices…it’s like getting to play dress up on Halloween. What are some brands you admire for their branding and voice? I look at a lot of SaaS companies. Basecamp is always great, and Mailchimp duh—they’re here in ATL. Evo is a hair product line that makes me laugh with the copy on the bottles. Harper Wilde is a bra business that’s made me giggle lately, too. How do you feel about exclamation marks and emojis in writing? Go for it! Typically, go easier on the exclamation points than you think, but they’re all good. How did you hear about HoneyBook? What’s your favorite feature? Before I bit the bullet and invested in a CRM tool, I tried EVERYTHING, like sending PDF contracts and PayPal’ing clients (whoops) and a few other popular tools. I got home from my first creative conference where I’d sat across from my friends Kat Schomyer and Jenna Kutcher. They told me it was time, and I needed a tool like HoneyBook. So, I got home, opened up my computer, pulled out my new business debit card, and spent $400 for membership. Since then, I’ve booked more than $100K just on that tool: I’d say I’ve made the investment back. I’ve booked more than $100K just on HoneyBook. I like that my branding stays consistent through imagery and templates, but mostly I like that it’s all in one place—client records, details, and project info is in one easy spot! 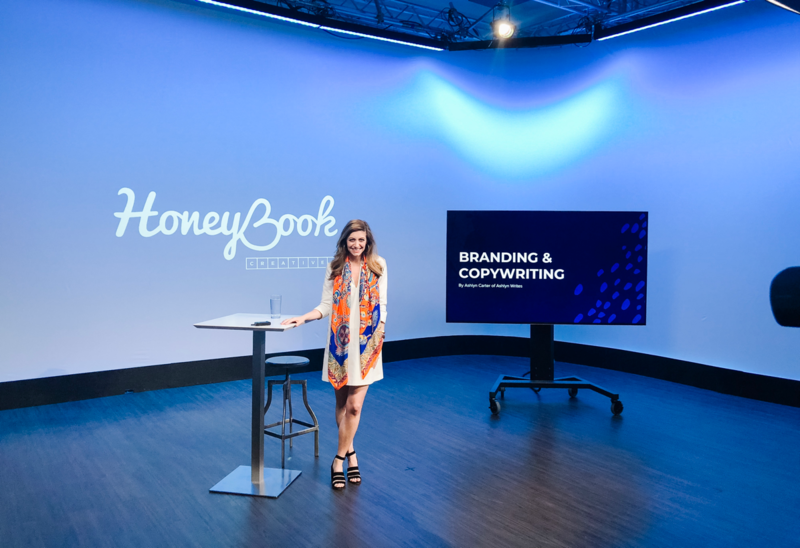 I finally found a tool that gave my clients an elevated, high-touch experience, and that was HoneyBook. I write about it a lot because a) I’m slightly project-management obsessed, thanks to agency years, and b) the team is really great—y’all have added tons of features I emailed to recommend … and even put me on the phone with a developer one time to explain what I needed. I appreciate that! Oh my gosh—I’ve always wondered what teachers meant when they lost their voice, and low and behold … I totally had lost mine by the end. I didn’t get it back ‘til about 3 days after I’d been home!